Comment déverrouiller l' LG G Pad 7.0 LTE à l'aide du code ? Le déverrouillage par le code d'LG G Pad 7.0 LTE est très simple. C'est aussi la seule méthode sûre et non invasive de se débarrasser du sim verrouillé. Vous obtiendrez le code pour déverrouiller l'LG G Pad 7.0 LTE sur la base du numéro IMEI. Le numéro IMEI s'affichera après avoir inscrit au clavier du mobile *#06# ou après avoir retiré la batterie. IMEI est donné sur l'étiquette informative comme le montre cette photo. Don't deceive people that you have to wait for 58 minutes. It only took a minute after sending the payment. Il codice mi è arrivato dopo pochi minuti. Fast Relatively cheap. All in all a great experience. 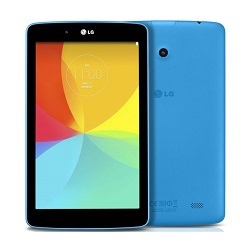 Comment entrer le code sur le mobile LG G Pad 7.0 LTE ? highly recommended this services l bought two tablets for my kids and we couldn't use them because there where lock to a network. l had decided to take them back the next day at night l discovered sim-unock.net. both my tablets where unlocked in less than 2minutes. thank you guys l am now a super hero dad my kids are enjoying their unlocked tabelts LG G Pad 10.0 and G Pad 7.0. Worked like charm. This is my first time using this so I can't fully judge this website but what I can say is that my first experience is that it was very fast. Didn't have to wait the 51 minutes specified. Great job guys. Great service Overseas with a tablet I brought locked from the US. Couple easy steps and not even 35 minutes later I was sent my unlock code and was ready to go Highly recommended. I am very pleased with this service. Rapid response time,I received my code within 15 minutes. I will be a returning customer. great. you guys are doing a wonderful job. very good service you guys are great. thank you. Thank you very much. It worked perfect for me. But, it's pricy, sorry to say. I am a Greek and in Greece a whole family eats for one day with 9 euros. Elegancko w 15 min. Dzia³a bez problemu. The service was quick and the code they gave me worked. Its a trusted unlock solution. This is my second unlock. Es el segundo equipo que desbloqueo y es 100% rapida, segura y confiable.